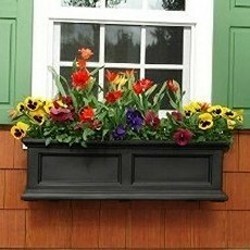 Window boxes add charm to any home. The Yorkshire window box collection is only available in white. 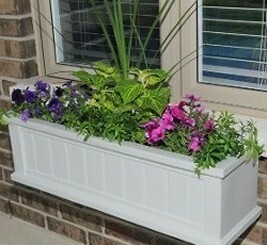 All other Mayne window boxes are available in Clay, White and Black. The Nantucket Collection offers an additional two colors – Green and Red. 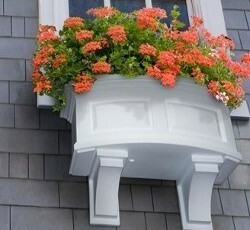 Enhance the look of your home with Mayne’s Cape Cod window box planters. Accent the edge of your patio or add a finishing touch under your windows. 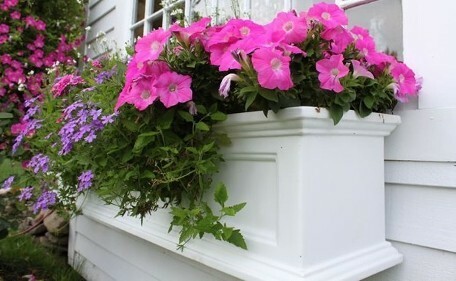 Included with each window box is a set of wall mount brackets that allow for easy removal of the planter making fall clean up a breeze. The Cape Cod window boxes also feature a water-reservoir that creates a self watering effect to keep your plants looking fresh! The new Nantucket window box features a bowed front raised panel design, pronounced crown molding detail and built-in overflow drains. Mayne planters will transform your property into a personal retreat with outdoor flair. Built-in water reservoir encourages healthy plant growth by allowing plants to practically water themselves. 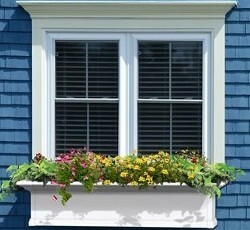 The Yorkshire window box has the charm of the East Coast while offering a low maintenance solution. Mayne commercial planters have exceptional durability, quality and long-lasting beauty. Draw attention to your hotel, motel or business with a statement of pride! Available in white only.